02:41 — Doctor Who: Series 10 (2016) already confirmed. 04:44 — Thunderbirds: Three new 1960s episodes to be made. 06:19 — Doctor Who: Titan Comics Eigth Doctor (Paul McGann) mini-series. 08:44 — Colin Baker: Last Man on Earth short film funded. 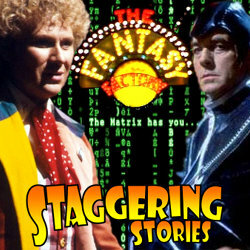 09:30 — Strangeness in Space: First episode now released, for free. 10:00 — Patrick Stewart: On wife’s music tour. 11:32 — Colin Baker: Fallen out with DWM? 13:14 – Doctor Who: The Ultimate Foe. 39:58 – The Matrix (1999 film). 56:16 – Farewell for this podcast! 57:38 — End theme, disclaimer, copyright, etc. Kickstarter: Thunderbirds 1965 – New episodes from 1960s recordings. YouTube: William Shatner – Sprout Clangers. This entry was posted on Sunday, August 2nd, 2015 at 10:41 and is filed under Doctor Who, Film, podcast, review, Sci-Fi, staggering stories, Staggering Stories Podcast, Staggering Stories Regular Podcast, The Matrix, tv. You can follow any responses to this entry through the RSS 2.0 feed. You can leave a response, or trackback from your own site.